Spacewalkers Chris Cassidy (EV-1) and Tom Marshburn (EV-2) ventured outside of the Quest Airlock on Saturday, in search of the source of an ammonia leak. The duo investigated the cooling loop of power channel 2B on the P6 Truss of the Station, and while the system appeared to be clean, the installation of a new PFCS appears to have resolved the issue. 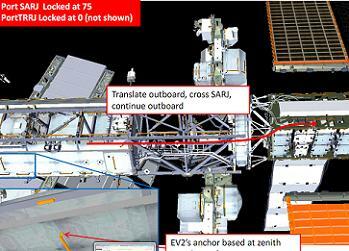 A huge effort has been undertaken to plan Saturday’s EVA, resulting in the crew being in a stance to conduct the EVA less than two days after the leak was first observed. Following pre-sleep tasks, the Expedition 35 crew helped the spacewalking duo through one of the more recent additions to life on the ISS, one that allows for spacewalkers to avoid the overnight campout in the Quest Airlock. The first order of business for Cassidy and Marshburn upon egressing the A/L was to translate out to the P6 Truss worksite. Upon arriving at the worksite, the spacewalkers told controllers on the ground they saw no obvious signs of ammonia flakes in the region. 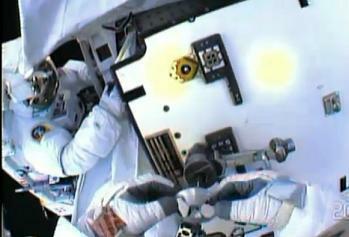 However, they did observe a “coffee stain” on one element of hardware, which they took photos of once they were in a daylight pass – due to a failure of the flash on their camera. The flash was later fixed. After fully setting up the worksite, the duo proceeded to begin work to remove the 2B Pump Flow Control Subassembly (PFCS). The removal was completed via the use of the Pistol Grip Tools (PGTs), driving the H1 & H2 bolts on the PFCS to close the Fluid Quick Disconnect Coupling (FQDC) ammonia valves between the PFCS and the P6 Truss. Again, the hardware was reported as looking “clean” – although a few specks of ammonia were observed as the H2 bolt was driven by the PGT. Next, they proceeded to drive the H3 and H4 structural bolts, allowing them to remove the PFCS from the P6 Truss Integrated Equipment Assembly (IEA). Photos were taken as the unit was removed, with no sign of ammonia in the area. The PFCS was temporarily stowed on the Multi Use Tether (MUT) “Ballstack”, following which a visual inspection was conducted of both the PFCS and the IEA to try and find a “smoking gun” for the source of the leak. With no source of the leak – or evidence of a leak – found, the spacewalkers could have re-installed the unit back into its original location, ahead of the spacewalkers heading back to the A/L to end the EVA, while teams on the ground re-evaluate the situation. Despite the leak source not being found, the spacewalkers moved to remove a new PFCS unit from its stowage location on the P6 Truss Long Spacer (LS) just next to the EVA worksite, again by driving the H3 and H4 structural bolts. The new PFCS unit was then be installed into the P6 IEA, in the location of the old PFCS unit, and the H3 & H4 structural bolts and H1 & H2 FQDC bolts were driven to complete the installation. In order to aid the investigation, the new unit’s Quick Disconnects (QDs) were opened, and the 20 lbs of ammonia in the new PFCS was used to charge the system via the use of the pump. This allowed for observations for any leaks and help the root cause evaluations. 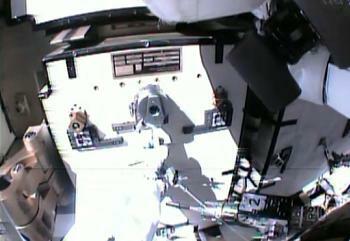 With no leaks seen by the spacewalkers – along with the system charging without issue – the new unit appears to have resolved the issue. However, it will take several weeks to confirm the problem is a thing of the past. 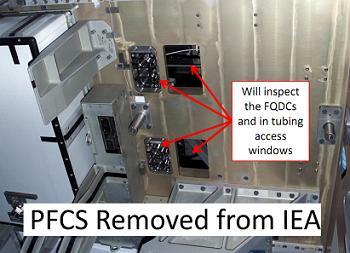 The old PFCS unit – which is now very likely to be the root cause of the ammonia leak – has since been installed into the previous location of the new unit on the P6 LS. With all the EVA tasks completed, well ahead of the schedule, the spacewalkers then monitored the new PFCS, as teams on the ground turned the system back into its nominal operating condition. Once again, no leaks were observed, which has allowed the spacewalkers to carry out the bake out protocol, which ensured no ammonia was brought back inside of the Station as they returned to the Quest Airlock. 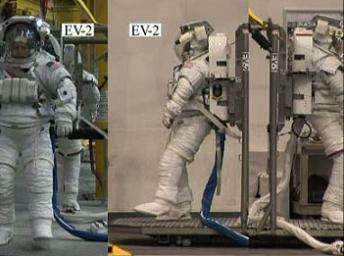 With the bake out complete, the EVA ended after five hours and 30 minutes.